Background: Nitraria sibirica fruit is a kind of folk medicine widely used in Northwest China. It contains diverse kinds of bioactive constituents such as flavonoids, alkaloids, and phenols. Objectives: The research was performed to develop an efficient separation method for the bioactive constituents of N. sibirica fruit and evaluate the isolated compounds bioactivities. Materials and Methods: An optimized method of high-speed counter-current chromatography (HSCCC) combined with preparative high-performance liquid chromatography (HPLC) was established and applied to prepare the bioactive compounds from the ethyl acetate extract of N. sibirica fruit. The antioxidant and anticomplement activities of the isolated fractions and compounds were evaluated in vitro. Results: Ethyl acetate extract was the predominant antioxidant and anticomplement fraction of N. sibirica fruit, which yielded 18 compounds including six phenols, three flavonoids, and five alkaloids. Seven compounds (2, 4, 5, 9, 10, 12, and 17) were first isolated from genus Nitraria. Furthermore, under the optimized chromatography conditions, one anticomplement alkaloid (1) could be achieved directly by one-step HSCCC with high purity (92.34%), the other seventeen compounds were further purified with preparative HPLC. Ten compounds (3, 6, 7, 8, 9, 10, 11, 12, 13, and 14) exhibited significant antioxidant activities. Five compounds (1, 2, 7, 10, and 16) showed anticomplement activities and targeted different components in the complement system. Conclusion: The study provided an efficient method to prepare antioxidant and anticomplement compounds and the activities of the compounds were deeply investigated. Abbreviations used: HSCCC: High-speed counter-current chromatography; DPPH: 1,1-diphenyl-2-picrylhydrazyl; FRAP: Ferric reducing antioxidant power; ABTS: 2,2'-azino-bis-(3-ethylbenzothiazoline-6-sulfonic acid); BBS: Barbiturate buffer solution; ASEA: Anti-sheep erythrocyte antibody; NHS: Normal human serum; 2% SRBC: 2% sheep red blood cells. Nitraria sibirica fruit contains various bioactive compounds, and the ethyl acetate extract is the main antioxidant and anticomplement fraction. An optimized High-speed counter-current chromatography method was established and eighteen compounds were prepared including ten antioxidant compounds and five anticomplement compounds. The targets of five anticomplement compounds also were revealed. Nitraria sibirica Pall., a common shrub mainly distributes in the desert area of Northwest China. The fruit of N. sibirica, also called “desert cherry,” usually is taken as healthy food and folk medicine for its beneficial activities, such as antioxidant and anti-inflammatory activity. Complement is an important part to the construction of the human immune system. However, its excessive activation always leads to varieties of autoimmune or acute inflammatory diseases., Previous reports addressed that the anticomplement activities of some herbs or functional foods were closely related to their beneficial effects on inflammatory diseases such as acute lung injury and endotoxic fever,, thus, the fruit of N. sibirica may contain some potential complement inhibitors. High-speed counter-current chromatography (HSCCC) is widely used in natural product separation, which possesses high-partition efficiency and can avoid sample loss as a support free liquid-liquid partition technology., Its good repeatability and high loading capacity also provide the possibility for large separation on industrial production. In this work, an efficient preparative method was established to obtain both antioxidant and anticomplement compounds from N. sibirica fruit by HSCCC coupled with preparative high-performance liquid chromatography (HPLC). All the compounds were evaluated the antioxidant activities by the 1,1-diphenyl-2-picrylhydrazyl (DPPH), ferric reducing antioxidant power (FRAP), and 2,2'-azino-bis-(3-ethylbenzothiazoline-6-sulfonic acid) (ABTS) assays. Their anticomplement activity and the inhibitory targets in the complement system were also assayed. All organic solvents (analytical grade) used for column chromatography, HSCCC, and preparative HPLC were purchased from Sinopharm Chemical Reagent (Shanghai, China). Acetonitrile and formic acid (HPLC grade) for ultra performance liquid chromatography (UPLC) were purchased from Merck (Darmstadt, Germany). Barbiturate buffer solution (BBS), heparin sodium salt, Vitamin C, trolox standard solution, DPPH, ABTS, FRAP assay kits, and FeSO4·7H2O standard solution were purchased from Beyotime Scientific (Nantong, Jiangsu, China). Antiserum (goat anti-human) of C1q, C2, C5, and C9 were bought from Abcam Biotechnology (Cambridge, UK). Antiserum (goat anti-human) of C3 and C4 were bought from Klarmar Reagent (Shanghai, China). Anti-sheep erythrocyte antibody (ASEA) was collected from rabbit antiserum. Normal human serum (NHS) was collected from healthy donors (average age of 25 years old). Alsevers' solution was used to reserve sheep blood. The collection of human and animal blood was approved by the ethical committee of School of Pharmacy, Fudan University. The dry fruit of N. sibilica was collected in Qinghai province, China and stored at −20°C until used. The fruit was identified by Dr. Yan Lu, and the voucher specimen (NSF-4) was preserved at our laboratory. A Bruker Avance III-600 spectrometer (Bruker Biospin Corporation, Billerica, MA, USA) was employed to record 1H-nuclear magnetic resonance (NMR) and 13C-NMR spectra. Mass spectrometry spectra were recorded on a Thermo LTQ Velos Pro MS (Thermo Fisher Scientific, San Jose, CA, USA). ACQUITY H-Class UPLC system (Waters Scientific, Milford, MA, USA) coupled with a YMC-Triart C18 column (150 mm × 2.1 mm, 1.9 μm) was used for analysis. A TBE-300A HSCCC was employed for separation (Tauto Biotechnique, Shanghai, China). The purification was conducted on an Agilent 1260 infinity HPLC system (Agilent Technologies, Santa Clara, CA, USA). The fruit of N. sibilica (2.8 kg) was extracted with 70% ethanol at room temperature by Herbal Flash Extractor (Zhijing Biotechnology, Zhengzhou, Henan, China), and the ratio (kg/L) of material to solvent was 1:30. The extract was filtered and evaporated to yield a deep red residue. The residue was suspended in water (1.0 L) thoroughly and partitioned with petroleum ether and ethyl acetate successively, the latter (18.6 g) was loaded on a silica gel column (100–200 mesh) and eluted with methanol/ethyl acetate (1:10, 5 L) and methanol (5 L) to afford the Fr 1 (8.6 g) and Fr 2 (6.2 g), respectively. Fr 1 was evaporated to dry and stored at −20°C. Partition coefficient values (K) is a critical parameter in the selection of solvent systems. A volume of 3 mL of each phase were added into a tube containing 2.0 mg Fr 1, and the contents should be separated shortly and clearly after full mixing, 1 mL of each phase were removed and analyzed by UPLC at 280 nm. The K values were calculated as K = A1/A2, A1 and A2 were the UPLC peak areas of the compound in the upper and lower phase, respectively. Before HSCCC separation, the selected solvent systems were thoroughly mixed and separated into two phases. Dissolving 800 mg of Fr 1 in 10 mL upper phase of petroleum ether/ethyl acetate/methanol/water (1:6:1:6; v/v) as the sample solution, then it was filtered through a 0.45 μm membrane and waited for injection. The HSCCC separation was initiated by filling the column with the upper phase (stationary phase) of petroleum ether/ethyl acetate/methanol/water (1:6:1:6; v/v). With the equipment running at the speed of 850 rpm, the corresponding lower phase (mobile phase) was pumped into the column at a flow rate of 1.8 mL/min in head-tail elution mode, after the solvent system equilibrating, 10 mL Fr 1 solution was injected. When the separation carried out for 300 min, the mobile phase changed into the lower phase of petroleum ether/ethyl acetate/methanol/water (1:6:3:4; v/v) and it was pumped with the same flow rate and elution mode for another 300 min. Ten fractions (Fr A-J) were detected at 280 nm and collected manually. Except Fr H, the other nine fractions needed to be further purified by a preparative HPLC coupled with a phenomenex-Luna C18 column (250 mm × 10 mm, 5 μm). The mobile phase consisted of acetonitrile (a) and 0.2% formic acid water (b) with gradient elution as follows: Fr A, B, C: 0–10 min, 5%–10% A; 10–30 min, 10%–25% A. Fr D, E, F: 0–20 min, 10%–15% A; 20–40 min, 15%–40% A. Fr G, I, J: 0–30 min, and 10%–40% A. The UV wavelength was 254 nm and the flow rate maintained at 5.0 mL/min. Three different methods (DPPH, FRAP, and ABTS) were used to reveal the antioxidant capacity synthetically. The absorbance in this study was measured in triplicate by an automatic microplate reader (Thermo Fisher Scientific), against a blank control of deionized water and positive control of Vitamin C, and the results were statistically analyzed with one-way ANOVA on the software of Graphpad Prism 5.01 (GraphPad Software Inc., San Diego, CA, USA). C was the sample concentration (mg/mL), M was the mmol/L of trolox standard solution is equivalent to the corresponding sample solutions in the assay. The antioxidant capacity was expressed as millimoles of trolox equivalent per gram of dry sample (mmol trolox/g). FRAP assay was performed based on the reported method with some modifications. Dilute 10 mmol/L FeSO4·7H2O to different concentrations as standard solutions. 180 μL FRAP solution was mixed with 20 μL sample solutions (2 mg/mL) or standard solutions at different concentrations. All the mixture incubated for 15 min and the absorbance was measured at 593 nm. 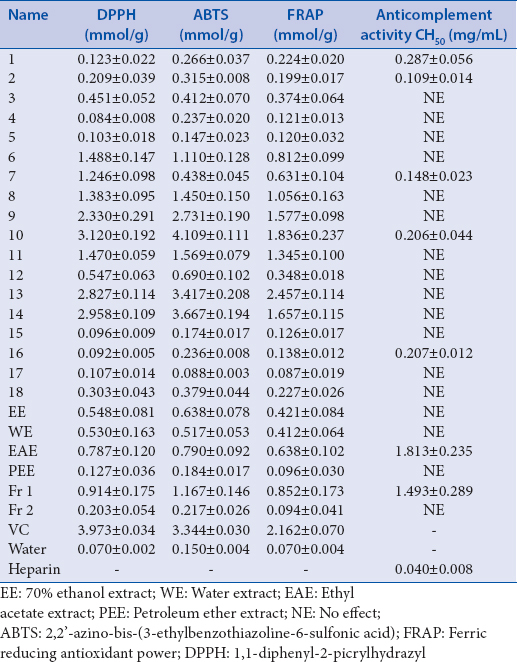 The FRAP calculation was similar to DPPH, and the value was expressed as (mmol FeSO4·7H2O/1 g of sample). ABTS assay is a rapid method to evaluate the free oxygen scavenging capacity. The preparation of standard curve of trolox was the same as DPPH assay described above. 20 μL peroxidase working solution was mixed with 10 μL sample solutions (2 mg/mL) or trolox solutions at different concentrations, then 170 μL ABTS solutions were added and the mixture incubated for 10 min. The absorbance was measured at 414 nm and the expression of antioxidant activity (mmol trolox/1 g of sample) was the same as DPPH assay. The assay of anticomplement activity was performed according to the previous research with some modifications. In brief, NHS (1:5 diluted) and ASEA (1:1000 diluted) were diluted by BBS. Nearly 2% sheep red blood cells were prepared following the previous research. 1 mg of the samples and heparin sodium salt were weighed precisely and dissolved in 1 mL BBS as sample solutions and positive solution, respectively, and diluted to different concentrations. Then, the different mixture was prepared according to Table S1 in supporting information, after incubating at 37°C for 30 min, the mixture was centrifuged and the supernatant was measured at 405 nm. The inhibitory percentage was calculated by the equation below and the fitted curve between sample concentration and inhibitory percentage was obtained. AS, AC, and AW were the absorbance of sample team, control team, and 100% lysis team, respectively. The CH50 value was the corresponding sample concentration when the inhibitory percentage is 50% according to the fitting curve. The action targets of the isolated compounds with anticomplement activity were identified in the complement activation cascade. The preparation of the complement-depleted sera and the identification of the targets were implemented according to our previous research. The optimum concentrations of compounds (1, 2, 7, 10, 16) were 0.93, 0.42, 0.58, 0.86, and 1.23 mg/mL, respectively, which were the minimal concentrations to fully inhibit the hemolysis induced by NHS. The results were statistically analyzed with paired t-test on the software of Graphpad Prism 5.01 (GraphPad Software Inc., San Diego, CA, USA). The activity evaluation showed that the ethyl acetate extract exhibited more potent anticomplement activity and antioxidant activity than other parts. Thus, based on bioactive-guided principle, the ethyl acetate extract was further fractionated to obtain Fr 1 and Fr 2. Fr 1, with stronger anticomplement and antioxidant activities, was then separated by HSCCC. [Table 1] listed the activities of all extracts and fractions. A successful solvent system design is essential to HSCCC separation, and K values of the suitable solvent system should locate in the range of 0.5 < K<2. The K values of aconitic acid, caffeoyl malate, tryptophan, narcissin, and flazin were evaluated in five solvent systems [Table 2]. The result indicated that compounds with strong polarity had suitable K values in the solvent system of petroleum ether/ethyl acetate/methanol/water (1:6:1:6, v/v), the compounds with medium polarity had suitable K values in the solvent system of petroleum ether/ethyl acetate/methanol/water (1:6:3:4, v/v). Other parameters such as flow rate and sample loading amount can also influence the separation efficiency. The flow rate was studied at 2.0 mL/min and 1.8 mL/min, which both were suitable to the retention rate of the stationary phase. However, the flow rate of 1.8 mL/min gave better peak shape and separation resolution compared with 2.0 mL/min. In addition, when the flow rate was 1.8 mL/min, compound 1 with high purity (92.34%) could be isolated directly from Fr H through one-step HSCCC [Figure 1]. Sample loading amount was investigated from 300 to 1000 mg, indicating that 800 mg of Fr 1 was the optimum loading amount with good solubility and retention rate of stationary phase. Based on abovementioned analysis, the HSCCC separation was performed by a stepwise mode with the solvent system consisting of petroleum ether/ethyl acetate/methanol/water (1:6:1:6, v/v) in the period of 0–300 min and then eluted with next solvent system composed of petroleum ether/ethyl acetate/methanol/water (1:6:3:4, v/v) from 300 to 600 min. The sample loading amount and flow rate were set 800 mg and 1.8 mL/min, respectively. In total, 18 compounds were isolated from Fr 1 (8.6 g) under the optimized chromatography conditions. Compound 1 (84.3 mg) could be directly isolated from Fr H in one-step HSCCC; the other compounds were purified by preparative HPLC. Compound 15 (39.6 mg) was separated from Fr A (444 mg); 16 (17.5 mg), 17 (9.4 mg), and 7 (33.8 mg) were obtained from Fr B (268 mg); 4 (7.8 mg) was purified from Fr C (70 mg); 12 (4.1 mg) and 13 (14.8 mg) were yielded from Fr D (98 mg), 11 (9.3 mg) was purified from Fr E (79 mg); Fr F (464 mg) was purified to obtain 9 (4.6 mg), 2 (40.6 mg), and 6 (42.8 mg); Fr G (52 mg) was purified to give 10 (3.1 mg) and 18 (7.4 mg), Fr I (409 mg) was purified to yield 14 (17.9 mg) and 3 (63.7 mg); 5 (4.6 mg) and 8 (33.2 mg) were achieved from Fr J (254 mg). 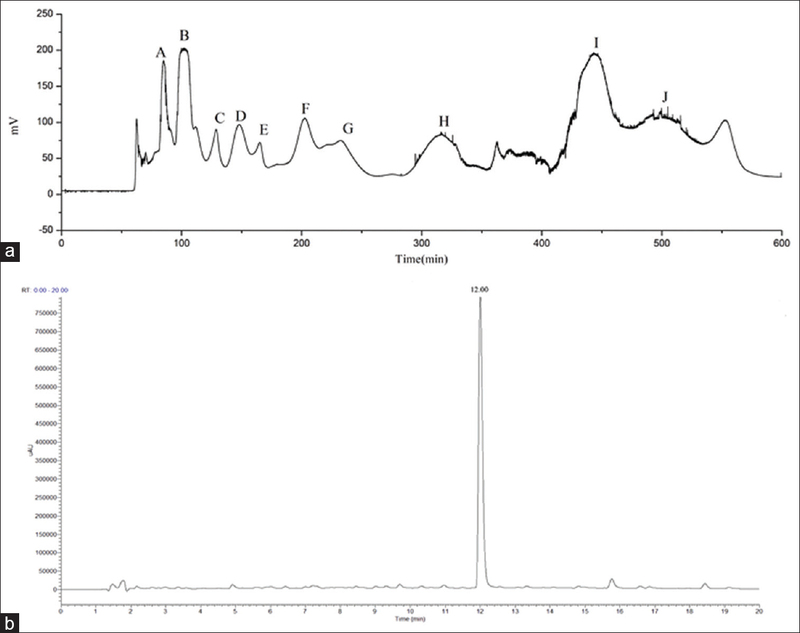 By comparing the data of 1H-NMR, 13C-NMR and mass spectra with literatures, the structures of all isolated compounds were identified as follows [Figure 2]: flazin (1), N-malonyl-tryptophan (2), tryptophan (3), 1H-pyrrole-2-carboxaldehyde (4), 2-[2-formyl-5-(methoxymethyl)-1H-pyrrol-1-yl]-propanoate (5), Narcissin (6), quercetin-3-O-glucoside (7), quercetin-3-O-(2G-rhamnosyl-rutinoside) (8), caffeoyl malate (9), depside (10), (E)-coumalic acid (11), P-Hydroxy- benzaldehyde (12), 3,4-dihydroxybenzoic acid methyl ester (13), benzaldehyde (14), 2-hydroxysuccinic acid methyl ester (15), cis-aconitic acid (16), 2-isopropylmalic-acid (17), and 5-Hydroxymaltol (18). Three alkaloids (2, 4, and 5) and four phenolic acids (9, 10, 12, and 17) were first isolated from N. sibilica fruit. It has been reported that the occurrence of many diseases is related to the oxidative stress. Some antioxidant constituents, such as anthocyanins, had been isolated from N. sibirica fruit, it's essential to evaluate the antioxidant activity of the isolated compounds. 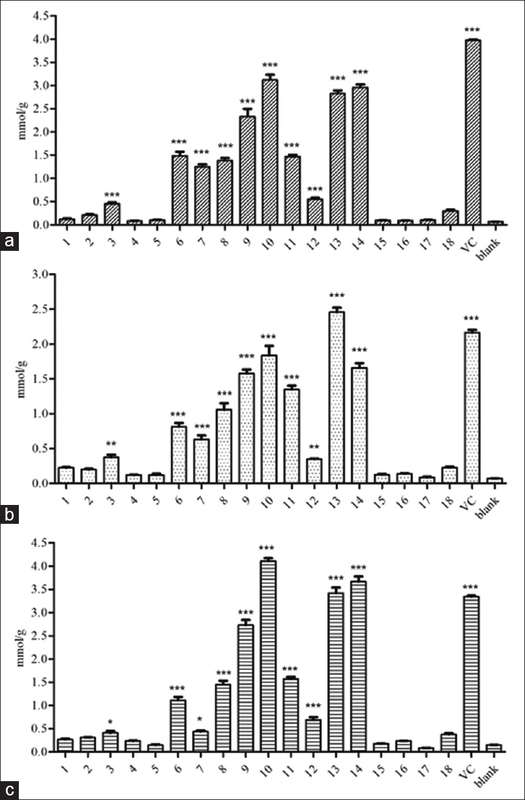 In this study, three different assays were performed to evaluate the antioxidant activity comprehensively and the results indicated good consistency [Figure 3] and [Table 1]. Ten compounds (3, 6, 7, 8, 9, 10, 11, 12, 13, and 14) showed good antioxidant activity and four compounds (9, 10, 13, and 14) exhibited almost equivalent antioxidant activity compared with Vitamin C [Figure 3]. The analysis on the structure-activity relationship showed that the compounds with two adjacent hydroxide groups (9, 10, 13, and 14) had more potent antioxidant activity. The classical pathway is a main pattern of the activation of complement system, and one of the direct results of the complement activation is the lysis of erythrocyte. Thus, the hemolytic assay was a common approach to screen the complement inhibitors. In the hemolytic assay, five compounds showed anticomplement activity [Table 1]. Compound 2 and 7 showed significant anticomplement activity through classical pathway with CH50 values of 0.109 ± 0.014 and 0.148 ± 0.023 mg/ml, respectively. Compound 1, 10, and 16 showed moderate anticomplement activity with CH50 values of 0.287 ± 0.056, 0.206 ± 0.044, and 0.207 ± 0.012 mg/ml, respectively. Previous research had demonstrated anticomplement activity of flavonoids, saponins, and terpenoids.,, However, there were few reports about the anticomplement activity of indole alkaloids and β-carboline alkaloids. The two anticomplement alkaloids (1 and 2) reported herein provided a new possibility of natural complement inhibitors design. The activation of complement system involves the cascade reaction of a series of components. Thus, the determination of the targets is necessary to further explore the action mechanism of the anticomplement compounds. Herein, C1q, C2, C3, C4, C5, and C9 were selected as the therapeutic targets. 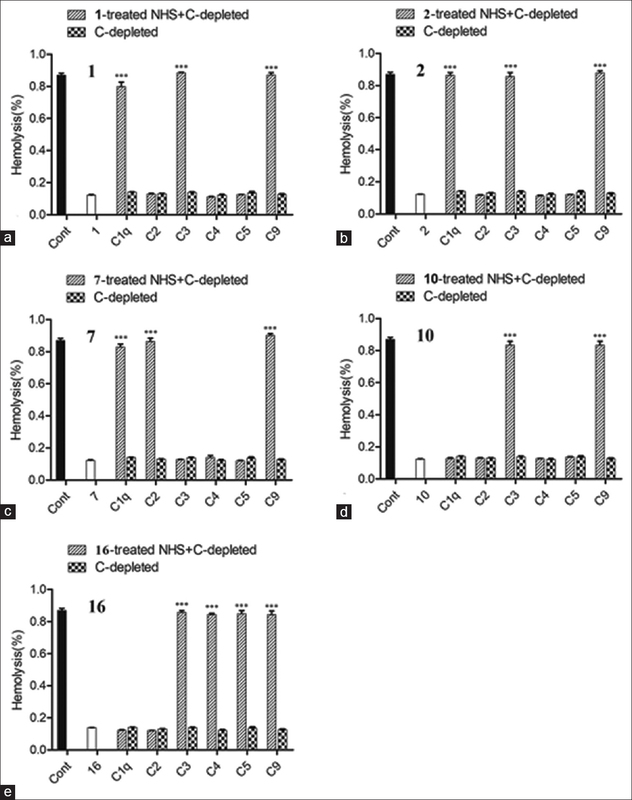 The effect of 1, 2, 7, 10, and 16 on individual complement components were assessed in the system containing the specified amount of complement-depleted serum and NHS. The capacities of multiple kinds of depleted sera to restore the hemolytic capacity of 1-, 2-, 7-, 10-, and 16-treated sera were evaluated to reveal the targets; the failure to restore the hemolysis should be on account of the interaction between the tested compounds and the corresponding complement components. The complement control group showed that the hemolysis percentage induced by NHS was 86.99% ± 2.57%. None of the complement-depleted sera can lead to significant red cell lysis independently (hemolysis percentage ≤15%). Herein, 16 (1.23 mg/mL) obviously inhibited the hemolysis induced by NHS (13.84% ± 1.46%). After NHS treated with 16, the 16-treated NHS incubated with C1q-, C2-, C3-, C4-, C5-and C9-depleted sera, respectively. The results [[Figure 4] and Table S2] showed that C3-, C4-, C5-, and C9-depleted sera still restored significant hemolysis of 16-treated serum (85.76% ± 2.15% for C3, 84.45% ± 1.49% for C4, 84.98% ± 3.86% for C5, 84.38% ± 4.63% for C9), while C1q-depleted and C2-depleted serum did not restore hemolysis (13.23% ± 0.68% for C1q and 13.03% ± 0.98% for C2). It meant that 16 interacted with C1q and C2, but not with C3, C4, C5, and C9. Similarly, the two alkaloids, 1 and 2 were found to block the same components of C2, C4, and C5 to inhibit the activation of the complement system. 7 was found to interact with C3, C4, and C5. 10 was found to interact with C1q, C2, C4, and C5. This work first reported the anticomplement compounds in N. sibirica fruit, as well as their inhibitory targets. The ethyl acetate extract was the main antioxidant and anticomplement part of N. sibirica fruit. 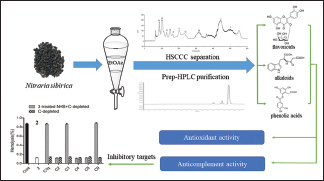 An efficient method was provided to prepare antioxidant and anticomplement compounds by HSCCC coupled with preparative HPLC. The study adds to the understanding of the bioactivities and chemical compositions of N. sibirica fruit and offers a large-quantity preparation method of antioxidant and anticomplement compounds from the fruit, which is beneficial to the development of N. sibirica fruit as traditional folk medicine. The therapeutic effects in vivo of these bioactive compounds from N. sibirica fruit will be further illuminated in the near future. This research was supported by grants from the National Natural Science Foundation of China (81673690, 81330089). 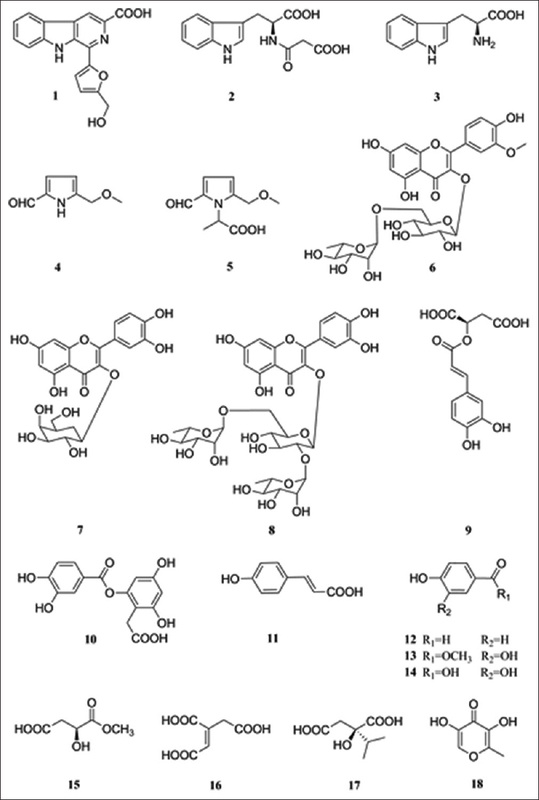 Du Q, Xin H, Peng C. Pharmacology and phytochemistry of the Nitraria genus (Review). Mol Med Rep 2015;11:11-20. Mika A, Reynolds SL, Mohlin FC, Willis C, Swe PM, Pickering DA, et al. Novel scabies mite serpins inhibit the three pathways of the human complement system. PLoS One 2012;7:e40489. Mollnes TE, Kirschfink M. Strategies of therapeutic complement inhibition. Mol Immunol 2006;43:107-21. Chu C, Ren H, Xu N, Xia L, Chen D, Zhang J, et al. Eupatorium lindleyanum DC. Sesquiterpenes fraction attenuates lipopolysaccharide-induced acute lung injury in mice. J Ethnopharmacol 2016;185:263-71. Xie JY, Di HY, Li H, Cheng XQ, Zhang YY, Chen DF, et al. Bupleurum chinense DC polysaccharides attenuates lipopolysaccharide-induced acute lung injury in mice. Phytomedicine 2012;19:130-7. Cao K, Xu Y, Zhao TM, Zhang Q. Preparation of sesquiterpenoids from Tussilago farfara L. By high-speed counter-current chromatography. Pharmacogn Mag 2016;12:282-7. Yang YF, Lai XY, Lai GY, Jiang ZD, Ni H, Chen F. Purification and characterization of a tyrosinase inhibitor from camellia pollen. J Funct Foods 2016;27:140-9. Xiao H, Cai X, Fan Y, Luo A. Antioxidant activity of water-soluble polysaccharides from Brasenia schreberi. Pharmacogn Mag 2016;12:193-7. Zhang S, Cui Y, Li L, Li Y, Zhou P, Luo L, et al. Preparative HSCCC isolation of phloroglucinolysis products from grape seed polymeric proanthocyanidins as new powerful antioxidants. Food Chem 2015;188:422-9. Du D, Lu Y, Cheng Z, Chen D. Structure characterization of two novel polysaccharides isolated from the spikes of Prunella vulgaris and their anticomplement activities. J Ethnopharmacol 2016;193:345-53. Xu H, Zhang Y, Zhang J, Chen D. Isolation and characterization of an anti-complementary polysaccharide D3-S1 from the roots of Bupleurum smithii. Int Immunopharmacol 2007;7:175-82. DI HY, Zhang YY, Chen DF. Isolation of an anti-complementary polysaccharide from the root of Bupleurum chinense and identification of its targets in complement activation cascade. Chin J Nat Med 2013;11:177-84. Ito Y. Golden rules and pitfalls in selecting optimum conditions for high-speed counter-current chromatography. J Chromatogr A 2005;1065:145-68. Li Y, Zhao M, Parkin KL. B-carboline derivatives and diphenols from soy sauce are in vitro quinone reductase (QR) inducers. J Agric Food Chem 2011;59:2332-40. Ludwig MJ, Hilgenberg W. N-manlonyltryptophan metabolism by seedings of Chinese cabbage. Phytochemistry 1989;28:2571-5. Risley JM, Defrees SA, Etten RL.18 O-isotope effect in 13C nuclear magnetic resonance spectroscopy. Org Magn Reson 1983;21:28-35. Don MJ, Shen CC, Lin YL, Syu WJ, Ding YH, Sun CM, et al. Nitrogen-containing compounds from Salvia miltiorrhiza. J Nat Prod 2005;68:1066-70. Joung YU, Kil YS, Nam JW, Jin LY, Kim JL, Seo EK. New pyrrole alkaloids with bulky N-alkyl side chains containing stereogenic centers from Lycium chinense. Helv Chim Acta 2013;96:1482-7. Xu ML, Li G, Moon DC, Lee CS, Woo MH, Lee ES, et al. Cytotoxicity and DNA topoisomerase inhibitory activity of constituents isolated from the fruits of evodia officinalis. Arch Pharm Res 2006;29:541-7. Kazuma K, Noda N, Suzuki M. Malonylated flavonol glycosides from the petals of Clitoria ternatea. Phytochemistry 2003;62:229-37. Liang YS, Kim HK, Lefeber AW, Erkelens C, Choi YH, Verpoorte R, et al. Identification of phenylpropanoids in methyl jasmonate treated Brassica rapa leaves using two-dimensional nuclear magnetic resonance spectroscopy. J Chromatogr A 2006;1112:148-55. Turner A, Chen SN, Nikolic D, van Breemen R, Farnsworth NR, Pauli GF, et al. Coumaroyl iridoids and a depside from cranberry (Vaccinium macrocarpon). J Nat Prod 2007;70:253-8. Achenbach H, Waibel R, Addae MI. Lignans and other constituents from Carissa edulis. Phytochemistry 1983;22:749-53. Omwamba M, Hu Q. Antioxidant capacity and antioxidative compounds in barley (Hordeum vulgare) grain optimized using response surface methodology in hot air roasting. Eur Food Res Technol 2009;229:907-14. Piao MS, Kim MR, Lee DG, Park Y, Hahm KS, Moon YH, et al. Antioxidative constituents from Buddleia officinalis. Arch Pharm Res 2003;26:453-7. Scott KN. Carbon-13 nuclear magnetic resonance of biologically important aromatic acids. I. Chemical shifts of benzoic acid and derivatives. J Am Chem Soc 1972;94:8564-8. Kohei K, Yohei T, Hanani E, Mansur U, Toshiko S. Chemical constituents of Morinda citrifolia fruits inhibit copper-induced low density lipoprotein oxidation. J Agric Food Chem 2004;52:5843-8. Guo WJ, Li GL, Hou YX, Wang RR, Liu Y, Wang W. Chemical constituents from the red alga Symphyocladia latiuscula. J Chin Pharm Sci 2017;26:754-62. Shinoda Y, Murata M, Homma S, Komura H. Browning and decomposed products of model orange juice. Biosci Biotechnol Biochem 2004;68:529-36. Duan FF, Jia SS, Yuan K. Antitumor effects and mechanism of n-butanol fraction from aril of Torreya grandis in H22 mice. Pharmacogn Mag 2017;13:351-7. Gao HW, Zhang MM, Liu YL, Xu QM, Yang SL. Anticomplement activity of ginsenosides from Panax ginseng. J Funct Foods 2013;5:498-502. Sun Q, Xu NY, Li QR, Yao S, Li M, Li HR, Chen DF. Antiglycemic and anticomplementary potential of an edible plant Gnaphalium hypoleucum DC. J Funct Foods 2017;9:321-8. Wen Q, Lu Y, Chao Z, Chen DF. Anticomplement triterpenoids from the roots of Ilex asprella. Bioorg Med Chem Lett 2017;27:880-6.